Jon Sharp's Formula One Racer, Nemesis, by Don Feight Over the past eight years, Jon Sharp's Nemesis has become the most successful race plane in the history of air racing. 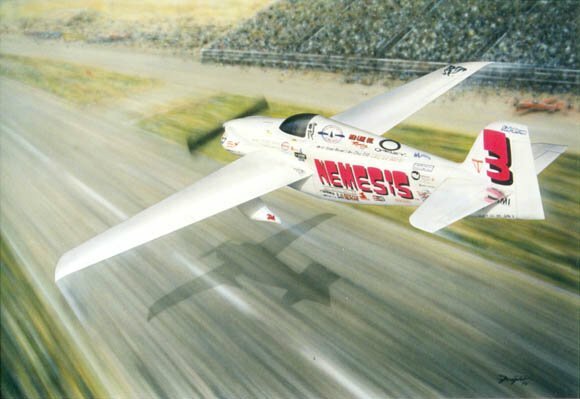 Team Nemesis and the plane's accomplishments include: eight consecutive Reno National Championships, three Bleriot Medals, three Pulitzer awards, fifteen world speed records, and they hold the qualifying record, lap record and race record for every course Nemesis has ever flown. A little over 30 million people either saw, read, or heard about Team Nemesis accomplishments in 1998. Team motto: "Chase the dream, not the competition." This Print is a limited edition of 750, signed/numbered by the artist and also signed by Jon Sharp. Included with each print is a certificate of authenticity, a Team Nemesis picture, and a biography/fact sheet about Jon and his plane.